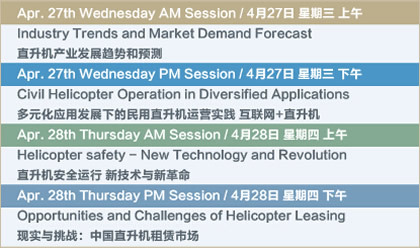 Do Not Miss Out on China's largest civil helicopter summit! The Greater China civil helicopter fleet continued to grow strongly in 2014 at a high rate of 29% - the highest growth rate in all of the Asia Pacific region – rising from 506 in year-end 2013 to 655 at year-end 2014. Out of these, 583 are based in Mainland China, 41 are in Taiwan, 30 are in Hong Kong and 1 is in Macau. With the opening of airspace and infrastructure continues to develop, the demand for helicopters in the Greater China region will continue to surge. On Nov. 23rd, 2015,the Government Council formally announced: Actively establish a new consumer guide, the file shows government would like to open low-altitude airspace positively, solve the system obstacle of the development of industry to make general aviation becoming increasingly prevalent in traditional high-end consumption. A banquet for civil helicopter industry in China. In this unique occasion, you can capitalize on the fast expanding helicopter opportunities in China, strengthen your leadership branding, gain visibility, increase market awareness, demonstrate your product value proposition and develop partnerships with key prospects. The Helicopter Night are the most hotly anticipated event in the conference’s calendar, recognizing and rewarding companies who has the most outstanding contributions and best practice in helicopter business. Judged by some of the industry’s biggest names, the Awards look to reward creativity, quality and originality. 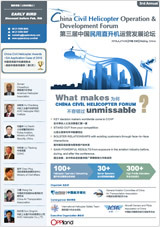 The official website of China Civil Helicopter Summit 2016 . Copyright © 2009 Oppland Corporation, All rights reserved.